Yarn: bags: ~450 yds; pouches: ~95 yds non-stretchy DK to light worsted plant fiber So many options! It all started with a straw backpack Kit found years ago at a New York street market. The bag is no more but Kit's sketch survived. We liked the capacious 'bucket' size, but preferred an oval base for less bulky proportions. 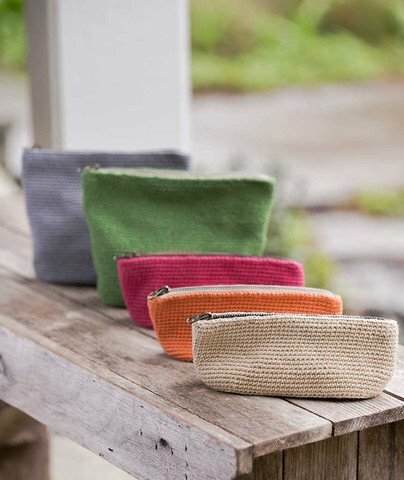 We created a handy smaller version and kept scaling down 'til we arrived at zippered pouches, perfect for notions, cosmetics, projects . . . . A bag for all reasons! Bucket bags come in two sizes, with options for drawstring or backpack straps. Pouches are also in two sizes, with instructions for adding a zipper and an optional fabric lining.